The D6000 has the key benefits of the D9000 retaining the long-range mode (LR) and the proprietary audio codec, with a two channel receiver and either handheld or bodypack transmitters. Both transmitters are proprietary to this series but can be used with the D9000 and visa versa existing units from the D9000 used with the D6000. They are paired by infrared matching, with up to 8 receivers being daisy chained without the need for any additional antenna splitter. While we're talking transmitters then let's talk power. The L6000 expands the D6000 series with a practical charging station where up to four modules can be fitted as needed with two charging ports each for bodypack or handheld transmitter batteries. The D6000 receiver is fitted with a Link Quality Indicator that ensures that issues get seen before any drop-outs occur. If, as in difficult RF environments, the signal should get temporarily corrupted to such an extent that the transmission error correction can no longer repair it, the intelligent error concealment of D6000 sets in. It employs intelligent learning algorithms to replace the corrupted part, enabling D6000 to still transmit flawlessly where other digital systems may fail. There are many challenges facing wireless technology and not least is the availability of channel space most notably in theatre areas such as Broadway where a production may require in excess of 100 channels, and that's just one production with others on the doorstep competing for frequencies. Sennheiser is adamant that channel density and the efficient use of the available spectrum is a top priority and the D6000 has been designed with this in mind. In the good old days the frequency spectrum was open from 470MHz to 960MHz but those days have long gone with the upper area of the band no doubt to be reduced further with other competing technology and cellular needs in the future. More channels simply have to fit in less frequency space and the D6000 advantage is that it does not produce any intermodulation frequencies. This means that you do not have to calculate your transmission frequencies around these intermodulation products but can arrange your microphones in an equidistant spacing meaning every 600kHz you can fit one wireless microphone. So with no unwanted or spurious noise 146 mics could function in the 88MHz range covered by three transmitter versions (470 - 558 MHz, 550 - 638 MHz, and 630 - 718 MHz). There are two receiver versions available, the EM6000 and the EM6000 Dante with a Dante connection on the rear - a noteworthy option to consider. Dante (Digital Audio Network Through Ethernet) is a combination of software, hardware, and network protocols that deliver uncompressed, multi-channel, low-latency digital audio over a standard Ethernet network. 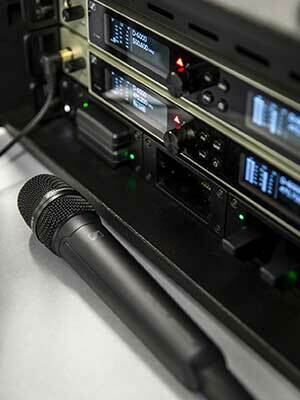 This means users can stream the audio information from any place via cat5 cable to the mixing desk. The big advantage of this concept is you are no longer running a big heavy multicore analogue snake. Simply plug your Dante output into an existing location network and off you go. There has been some talk of a second Dante output for the receiver in the future for redundancy across an independent network so that might be something to look out for in the future for a mission critical environment. With convergence with IT technology then the trend is growing to put audio and video information on a network which can then be distributed to any place, literally anywhere with a simple network connection. Remote mixing is a topic for the future and the prospects are really interesting and evolving giving many options of mixing say three live events around the globe in one evening all from your home studio. Right now latency is an issue but will no doubt be overcome in time. The D6000 is beautiful, well designed and rugged for the touring environment it will no doubt face. Not only will it find a home touring with top artists but also in broadcast and beyond. Sennheiser is clearly very careful and conscious towards frequency set-ups and reliability and as its message says, it accepts no compromise. Copyright © 2008 DIGITRA Co., Ltd.